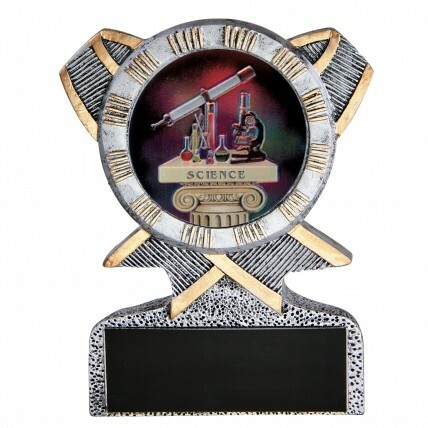 Award our Science Resin Award at your next Science Fair! Measuring 5 inches tall, this resin award features a circular hologram within crossed ribbons. The hologram image includes an astronomer's telescope, an optical microscope, and a chemistry set, all on an ionic column. The award is a pewter color with gold accents, and includes a black brass engraving plate with gold letters.